This post originally appeared in SplendaLiving.com. Whenever I see old television clips from American Bandstand, a popular television show in the 1950-80’s that featured teenagers dancing to the latest hit songs, I can’t help but think that all that dancing really helped to keep those kids in shape. Do you ever wonder what people will think about the youth of today when they look at archived YouTube videos 50 years from now? Sadly, what they will see is that about one-third of American children and adolescents ages 6 to 19 are overweight or obese, as reported by the National Institute of Diabetes and Digestive and Kidney Diseases. The only thing sadder than that statistic is the one that predicts 80% of these teens will become overweight or obese adults. The single most important step we can take to reverse this trend is to prevent excess weight gain right from the start in childhood. And if excess weight gain begins in adolescence, the next step is to stop or slow down the rate of weight gain during the teen years. Tackling that problem is important for health, much more so than body image, and is the focus of this blog. Research indicates that over-consumption of added sugars, from foods like full-calorie sodas and sweet treats, can increase the risk of becoming overweight in teens. The American Heart Association notes, “Although added sugars most likely can be safely consumed in low amounts as part of a healthy diet, few children achieve such levels, making this an important public health target.” Not having an abundance of sugar-sweetened foods and beverages in the house is the best way to help everyone in the family limit their intake of added sugars. It’s also important to talk to your teen about the need to eat all of the other foods that make up a balanced diet for good health, and to be a good role model for them to follow. The focus of these discussions with your teen should always be on achieving a healthy lifestyle, not a certain body weight. Here are some straight up sensible weight loss tips to help you and your teen get started. Sugar swaps: Your teen can enjoy the taste of something sweet without unnecessary added calories by swapping out some sugar for a low-calorie sweetener, like SPLENDA®No Calorie Sweetener. Use it in favorite hot and cold drinks, sprinkle some on plain yogurt layered with fruit and a crushed graham cracker for a parfait, or get creative in the kitchen making other lower-calorie dishes. Here are a few fun ones that your teen can prepare and share with the whole family – just remember to observe the yield and serving size for each recipe and make your selections with that in mind: Sweet and Spicy Snack Mix, Banana Mini-Chip Muffins and Harvest Pumpkin-Oatmeal Raisin Cookies. Revamp snacks:Making sure your teen eats regular meals and snacks during the day can be a helpful way to keep them from getting so hungry they overeat, or eat impulsively. And when you have foods on hand that your teen likes and can assemble quickly – like whole grain cereal and lowfat milk, lowfat cheese and crackers or hummus and carrots – it makes it easier for them to choose healthier snacks. Modify fast food menus: Have your teen download the menus from some of their favorite fast food restaurant chains and, together, highlight the healthier food choices available so you’ll both know what to order the next time either of you eat there. You can also look at the menus from other restaurants in your area to see if they offer options your teen would like to try the next time you are dining out together. Reduce added sugars and calories in drinks: Most teens have no idea how much sugar and calories they drink in a typical day. Here’s a great printable chartfrom the National Institutes of Health “We Can!” program. You can also encourage your teen to drink water with and between meals. Take a stand: Being active doesn’t mean that you or your teen has to spend hours in the gym. Even standing instead of just sitting can help burn calories, such as when texting, talking on the phone or face-timing. The goal is to sit less, and then move a little more while standing – maybe rocking in place or pacing the room. Taking a walk together is always a great way to get moving, and if you can convince your teen to leave the phone behind you might have a great conversation along the way! Move Together: Encourage every member of the family to think of ways you can do things together away from the computers and TV screens to be more active as a family. You can include household chores like raking leaves or biking to the library to return some DVDs. Just be careful you don’t talk about exercise as a punishment. You want your teen to know being active is fun and feels good. Go with the flow:Yoga is still “in” right now, and it’s hard to believe that it has been practiced for over 5000 years. Encourage your teen to try it with you, or download an app that shows some poses to start stretching and breathing for relaxation while improving fitness. If you’re interested in more healthy lifestyle tips for teens, be sure to check out my other blogs on the topic: Healthy Eating Choices for Children and Teens and Winning Kids Over from Sugary Drinks to Ones with Less Added Sugar or Sugar-Free Drinks. I have been compensated for my time by Heartland Food Products Group, the maker of SPLENDA® Sweetener Products. All statements and opinions are my own. I have pledged to Blog with Integrity, asserting that the trust of my readers and the blogging community is vitally important to me. Robyn Flipse, MS, MA, RDN, “The Everyday RD,” is an author and nutrition consultant who has headed the nutrition services department in a large teaching hospital and maintained a private practice where she provided diet therapy to individuals and families. With more than 30 years of experience, Robyn is motivated by the opportunity to help people make the best eating decisions for their everyday diet. She believes that choosing what to eat should not be a daily battle and aims to separate the facts from the fiction so you can enjoy eating well. This blog was originally written for CalorieControl.org. You can read that post here. If you’ve stepped into an air-conditioned store to get out of the August heat, then you know retailers are all stocked up to help us get our children ready to go back to school. Everything from highlighters to hand sanitizer is on the shelves to satisfy the “must have” list for kids in every grade. I recall one of the biggest back-to-school decisions my sons made each year was finding just the right lunch box they could carry with pride into the cafeteria. Having their favorite superhero on the outside was all that mattered to them! What goes inside all those carefully selected lunch boxes has taken on greater significance over the last 16 years since September was first declared National Childhood Obesity Awareness Month. It was launched to focus attention on the need for kids across the country to lead healthier lives and prevent the early onset of obesity. Providing our children with a balanced and nutritious midday meal is an important way we can do just that. Children need to be properly nourished to reach both their physical and intellectual potential. Even when they look fit and appear to be thriving, an inadequate diet can set the stage for future health problems. Eating well-planned meals and snacks each day is one of the best ways to ensure that all of the essential nutrients children need for growth and development are being consumed. The routines of the school day provide an ideal way to help children form good eating habits that can last a lifetime. Starting with breakfast – either at home or in school – kids need to refuel their bodies in the morning after the overnight fast and get key nutrients that will make them ready to learn. A mid-morning snack also may be needed by younger children, or a breakfast split into two parts, to carry them over until their next meal. When the lunch bell rings at school it’s time for kids of all ages to eat something nourishing, socialize with friends and, hopefully, get some physical activity. Sitting behind a desk all day is not good for children or adults, so taking advantage of this, and every other opportunity to get up and move around is perfect practice for a healthy lifestyle. By the time the school day ends, most children are hungry and thirsty. That’s a good time to offer them nutrient-rich foods and beverages to replace any they may not have eaten at breakfast or lunch rather than letting them fill up on less nutritious snacks. Some popular options include cut-up vegetables and hummus, whole wheat crackers and cheese or a fruit smoothie made with yogurt. The goal is to reenergize and rehydrate them for their afternoon activities without letting them get too full to eat their dinner. Making time to eat with your children each evening can provide one of the biggest boosts to their well-being, regardless of what is served. Research reported in the Family Dinner Project indicates children who eat with their family have higher self-confidence, better grades in school and lower rates of obesity among other benefits. Getting them involved in meal planning and preparation adds to their success by teaching them skills they will need the rest of their lives. What About Weight Gain in Children? Preventing unwanted weight gain in children requires that they get enough calories to support normal rates of growth and physical activity, but not much more than that. It is a delicate balance that must be adjusted to meet their changing needs, such as when their activity level slows down after their regular sport season ends. While plenty of attention goes into making sure the first packed lunch of the year a good one, it’s important that every lunch is as good as the first. One way to do that is to create an idea board—like a Pinterest board—to use as a template for packing lunches. Start by drawing a grid similar to the one illustrated, and then let your child list items under each food group heading that he or she likes, will eat in school and can be easily assembled each day. Remind your children they don’t have to limit themselves to “traditional” lunch foods as long as the items belong in the designated group. You can see sample foods found in each group on ChooseMyPlate.gov along with the recommended daily servings for children of different ages and the suggested portion sizes. Following the My Plate Daily Checklist will allow you to see how many calories your child needs each day and how to be sure they are getting all of the nutrients they need in their meals and snacks, without exceeding their recommended caloric allowance. Once the chart is completed lunches can be packed using any combination of foods from each list as long as your child will eat them. All you have to do is make sure the items on the chart are on hand at the start of each week! This post was originally written for TheSkinnyOnLowCal.org. When college students return to campus after their winter break most of them can’t tell you exactly when they’ll be taking their final exams, but they all know the dates for spring break. Reservations are booked long before anyone cracks open a book at the start of the semester. Escaping to someplace tropical for fun in the sun is standard fare, but for many there is a souvenir that can linger long after the tan marks have faded. It’s called creeping obesity. Just like holiday weight gain that isn’t lost from one year to the next, weight gained while on vacation can contribute to creeping obesity – or gradual weight gain over time – if those extra pounds aren’t lost when you get home. A recent study found the average weight gain for vacations of one to three weeks was .7 pounds, with some subjects gaining as much as 7 pounds. Another finding in that study was that weight was gained despite the slight increase in physical activity reported during vacations. Apparently snorkeling and beach volleyball aren’t enough to offset the increased caloric intake, especially from alcoholic drinks which tended to double while on vacation! Gaining a small amount of weight may seem like no big deal, but as I said in my book Fighting the Freshman Fifteen, if you don’t deal with the ounces they’ll turn into pounds by the time you graduate. And since it’s much easier to lose one or two pounds than five or ten, why not make it part of your vacation plans to drop those unwanted pounds as quickly as you gained them? Here’s how to do it. Ways to Spring Back From a Spring Break! Know Your Number– Before you go on vacation use a customized program, like SuperTracker, to determine the number of calories you consume each day to maintain your present weight with your usual amount of physical activity. This is number your baseline calorie allowance. Step on the Scale– Weigh yourself before you leave for vacation and again on the morning after you return to see if you’ve gained weight and how much you need to lose to get back to your pre-vacation weight. Weigh yourself daily while following the steps below until you reach your goal. Keep a Record– Start recording everything you eat and drink, and the amounts, so you can tally your daily caloric intake. Keep it 200 calories below your maintenance number, calculated in #1. One way to drop 200 calories a day is to replace sugar-sweetened drinks with diet drinks and to use no- and low-calorie sweeteners in place of sugar. Up Your Activity– Increase your usual time spent in physical activity by at least one hour per week by adding a single 60-minute workout or an additional 15 minutes to four regular workouts. Monitor Your Maintenance– You can stop the calorie counting and extra hour of exercise once you return to your pre-vacation weight, but continue to weigh yourself weekly. Resume the food records and added exercise time if you see your weight going up before your next vacation. Robyn Flipse. Fighting the Freshman Fifteen. Three Rivers Press, 2002. Robyn Flipse, MS, MA, RDN is a registered dietitian and cultural anthropologist whose 30+ year career includes maintaining a busy nutrition counseling practice, teaching food and nutrition courses at the university level, and authoring 2 popular diet books and numerous articles and blogs on health and fitness. Her ability to make sense out of confusing and sometimes controversial nutrition news has made her a frequent guest on major media outlets, including CNBC, FOX News and USA Today. Her passion is communicating practical nutrition information that empowers people to make the best food decisions they can in their everyday diets. Reach her on Twitter @EverydayRD and check out her blog The Everyday RD. Weight Loss Tips: Can SPLENDA® Sweeteners Help with My Weight Loss Goals? This post was written as a guest blog for SplendaLiving.com. You can read the original post here. If all you ever hear is “diets don’t work,” it’s easy to become discouraged about trying to lose weight. You even may have tried a few fad diets yourself and gained first-hand experience with their long-term ineffectiveness. But that doesn’t mean there is no hope in controlling your weight. What it may mean is you’re ready to forget about fad diets and turn to the research on what does work for weight management. Here’s a short recap of some of the latest findings that can help. Research published in the May 2015 Journal of the Academy of Nutrition and Dietetics reviewed 10 studies on the impact of replacing sugar-sweetened beverages with alternative lower calorie beverages, including water and diet drinks made with no-calorie and low-calorie sweeteners, such as SPLENDA® Sweetener Products. The researchers found this simple substitution was associated with lower calorie intake and lower weight gain in the long term. Based on the available evidence, the researchers concluded there is a potential benefit on body weight by substituting water and other low-calorie beverages for sugar-sweetened ones. The above results were reinforced in a larger systematic review of the evidence from 90 animal studies and 245 human studies in adults and children on the effects of low-calorie sweeteners on energy intake and body weight. The findings were published in the International Journal of Obesity in November 2015 and found no evidence from the many short and long term studies in humans that “low energy sweeteners” increase energy intake or body weight. In fact, the review concluded that use of no-calorie sweeteners in place of added sugar, can help one to lose weight and that research should now be focused on how we can best use no-calorie sweeteners for the most effective weight loss strategies. And just in case you’ve heard that consuming low-calorie sweeteners might backfire by increasing your preference for other sweet tasting foods and drinks, another important study put that myth to rest. In a paper published in Current Obesity Reports in March 2015, researchers analyzed the data from several types of studies to determine the effects of no- and low-calorie sweeteners on appetite for, and intake of, sweet tasting products. What they found was there was no consistent relationship to support a heightened appetite for sweet foods, and some studies actually showed no- and low-calorie sweeteners were associated with consumption of fewer sweets. In studies involving both children and adults the research showed the use of no- and low-calorie sweeteners can reduce the intake of caloric sweeteners and support weight loss efforts. The Annual Review of Public Health in March 2015 published a review of dozens of studies that looked at the use of text messages to assist people in reaching their health goals. One of the first things the researchers found was there is a wide range of app features and types of messages available. Some apps allow for interaction, offer personalized messages or can be programmed to customize the frequency of message delivery. General messages offer advice, motivation, encouragement, tips and/or support to users on a regular basis. The researchers found the majority of the interventions were effective when addressing weight loss and some other health goals including smoking cessation and diabetes management. In short, it’s like having a support group in your smartphone. The foods on the kitchen counter in your own home can have an impact on your weight, according to a study published in Health Education and Behavior in October 2015. The researchers found the more visible and convenient foods such as cookies, cereal and soft drinks are in the kitchen, the more likely household members will have a high Body Mass Index. On the other hand, the food most often found on kitchen counters in homes of people who are not overweight was fresh fruit. These results are consistent with other research done by this team that found office workers ate more candy when it was on their desks than when it was in the desk drawer or on a filing cabinet. According to lead researcher Brian Wansink, PhD., the visibility and convenience of food has a greater influence on how much we eat compared to hunger. Switch to no-calorie and low-calorie sweeteners, like SPLENDA® No Calorie Sweetener, in place of sugar in your drinks and use diet beverages and water instead of full-calorie drinks. Download a coaching app to your smartphone, tablet or computer to support and encourage you to reach your weight loss goals every day. Remove high calorie, high fat snack foods from the kitchen counter (and office desk) and keep a bowl of fresh fruit on the counter. What’s Your Plan For A Stuffed Refrigerator? This post was written as a guest blog for TheSkinnyOnLowCal.org. You can read the original post here. Anyone hosting a Thanksgiving dinner has to have a game plan to make sure all of the food needed for a successful meal is purchased, prepared and properly served. But what about the days after Thanksgiving when your refrigerator is stuffed with assorted leftovers? Do you have a plan for that food so it doesn’t go to waste or end up around your waist? No need to worry, help is on the way! Just use these tips to turn those leftovers into completely new menu options that will let you enjoy the tastes of the day, but with a healthy new twist. Smoothies – Use leftover undressed garden salad, fruit salad, crudité vegetables and cooked leafy greens to make a smoothie to fuel you through your Black Friday shopping. Add any slightly bruised apples that didn’t make it into the pie and the remains in that jug of apple cider to sweeten. Crumbs & Croutons – Leftover yeast breads and rolls can be cubed, placed in a baking pan and baked until toasted on all sides for use as croutons. (Be sure to store them in an airtight container to keep them crisp.) Unused stuffing mix, cornbread, crackers, chips and nuts can be turned into crumbs and frozen for future use. Just store each of them in separate labeled bags for easy identification. Soup – Mashed white or sweet potatoes (without marshmallows) and roasted root vegetables are all you need to make a hearty soup. Add them to a pot with leftover turkey stock (or a little gravy and water) then use an immersion blender to puree. Punch up the flavor with curry seasoning or sriracha sauce, bring it to a low boil, then reduce the heat and simmer for 10 minutes. Add croutons made from your leftover bread for a lunch that will satisfy with far fewer calories than a reheated plate of leftovers. Dips & Spreads – Put marinated vegetables from an antipasti tray, such as mushrooms, artichoke hearts or asparagus, in the blender with drained canned white beans to make a tasty vegetable hummus — or mix the pureed vegetables with any leftover hummus. Enjoy with cut up celery stalks not used in the stuffing. Combine roasted red peppers and caramelized onions in the blender with assorted olives for a flavorful tapenade to spread on a turkey wrap. Give leftover peas and pearl onions a whirl in the blender with the remains of the guacamole for a lighter version of this classic dip. Omelets & Frittatas – Shred and combine leftover pieces of different hard cheeses to add to egg dishes along with diced baked potatoes, broccoli, green beans and other vegetables. A simple veggie omelet is an ideal high-protein low-carb dinner for the day after the feast. Second Chance Desserts – Treats that are out of sight are out of mind, so cut leftover pies and cakes into individual portions, wrap each in plastic wrap, then label, date and freeze them to enjoy at a time when you can afford those extra calories. Help the Hungry – Don’t forget to donate any extra nonperishable foods, such as canned pumpkin, boxed pasta, bagged stuffing and bottled juices to your local food pantry to help feed those with no leftovers. It’s a great way to celebrate the true meaning of Thanks-giving! This post was written as a guest blog for Aspartame.org. You can read the original post here. It’s that time of year when our homes and offices become filled with an assortment of chocolatey, chewy and crunchy candies as we approach Halloween and its aftermath. I know I can’t resist grabbing a few fun-sized bags of my favorite M&Ms from the trick-or-treat bowl when I see them. But what does this sugar-laden holiday mean for the 30 million American children and adults who have diabetes? And how much added sugar can the rest of us enjoy without putting our health at risk? According to a new survey from the National Confectioner’s Association (NCA), Halloween is the top candy-giving holiday of the year with retail sales expected to reach $2.6 billion in 2015! Fortunately, most people understand candy is a treat to be enjoyed in moderation and nearly 80 percent of parents report they have a plan in place to help children make smart choices after bringing home their Halloween haul. Some parents limit the number of pieces their child is allowed per day while others limit the stash to a certain amount and then get rid of the rest. I like to swap out some candy for sugar-free gum since chewing it can help prevent cavities at the same time it eliminates a food that can cause them. Since Halloween isn’t the only time of year when we eat candy it helps to know how much added sugar we can include in our diets to make room for it when we do. The World Health Organization (WHO) recommends we limit added sugar to less than 10 percent of our total calories. This is equivalent to around 50 grams of sugar (12 teaspoons) a day for someone consuming 2000 calories. The WHO suggests further reductions in added sugar to less than five percent of total calories for additional health benefits. The NCA reported candy contributes about 50 calories a day to the average American diet, which can mean 4-12 grams of sugar (1-3 teaspoons) depending on the type of candy. That would get you approximately 2 chocolate kisses or 2 hard candies, so if your habit is greater than that you may want to satisfy your sweet tooth with the sugar-free varieties. The good news for people with diabetes is that the day after Halloween is the start of American Diabetes Month. November 1st is a perfect time to refocus on the goals for good diabetes management, including eating a healthy and balanced diet. 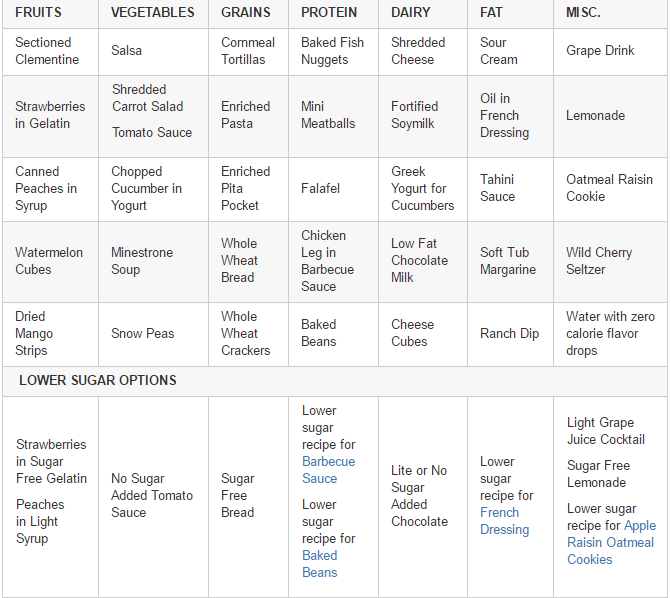 Added sugars can be a part of it, but the amount is based on individual carbohydrate allowances at each meal and snack. Since many foods that provide essential nutrients are also a source of carbohydrate, such as fruit, grains and vegetables, it is important for people with diabetes to use their available carbohydrate count for those choices first. Artificial sweeteners, such as aspartame, provide a way to sweeten foods and beverages without unwanted sugar, carbohydrates and calories. For example, a packet of Equal® can replace 2 teaspoons of sugar in a cup of coffee, bowl of oatmeal or dish of yogurt. Another option is to make your own sweet treats like these Double Chocolate Brownies and Fruit Kabobs with Coconut Cream Dipping Sauce. They do have calories and carbohydrates from other ingredients, but less than the original versions and still taste great. Robyn Flipse, MS, MA, RDN is a registered dietitian, cultural anthropologist and scientific advisor to the Calorie Control Council, whose 30+ year career includes maintaining a busy nutrition counseling practice, teaching food and nutrition courses at the university level, and authoring 2 popular diet books and numerous articles and blogs on health and fitness. Her ability to make sense out of confusing and sometimes controversial nutrition news has made her a frequent guest on major media outlets, including CNBC, FOX News and USA Today. Her passion is communicating practical nutrition information that empowers people to make the best food decisions they can in their everyday diets. Reach her on Twitter @EverydayRD and check out her blog The Everyday RD. This post was written as a guest blog for CalorieControl.org. You can read the original post here. There are many controversies in the field of nutrition, but one thing everyone seems to agree with is that it’s easy to gain weight! All it takes is a subtle disruption in the energy balance of the body. That can happen when we consume more calories (energy) than we need or are not active enough to use up all of the calories (energy) we’ve consumed – or a bit of both. Living on a college campus can make it even easier to gain weight. The notorious “freshman 15” may be a bit exaggerated, but even gaining five pounds is more weight than most students want or need. Learning how to balance your energy while away at college may be one of the best lessons you can learn. Here are 10 Tips for Fighting the Freshman Fifteen to help keep you in energy balance from your first year on campus to the last! Start your day with a meal – no matter what time you wake up – to avoid random snacking for the rest of the day. Even a leftover slice of cheese pizza and a glass of orange juice counts as a meal! Take advantage of the breakfast items available all day for a nutritious and lower calorie meal, such as a cereal, yogurt, fruit parfait, vegetable omelet, or peanut butter and sliced banana on a toasted English muffin. Stock the mini fridge and personal food bin in your dorm room with single-serving calorie-controlled foods and drinks you can eat on the go, such as low calorie drinks in cans or bottles, granola bars, fruit cups, hummus, cheese sticks and yogurt. Schedule your physical activity for certain days and times each week, just like a class, so you’re sure to get it done – and never miss the chance to walk or ride a bike instead of taking a car or bus to class. Keep your hot and cold drinks lower in calories by adding a no calorie sweetener instead of sugar and choosing diet or low-calorie beverages made with them. Explore the international and vegetarian food choices in the cafeteria to find more flavorful vegetable-based dishes that are lower in calories than standard American fare. Join a CSA (Community Supported Agriculture) with like-minded house mates to have a steady supply of fresh fruits, vegetables and herbs all semester long and the chance to burn some calories working on the farm to pay for your share. Reach for some sugar-free frozen yogurt topped with berries for a sweet treat, instead of regular ice cream covered in candy bits. Have designated eating places on campus for eating (cafeteria, student lounge) and other places that are off-limits (library, lecture hall) so you won’t snack mindlessly everywhere. Stay in motion when not studying by playing competitive Virtual Console games, joining an intramural team, trying out new equipment at the fitness center, taking a Zumba class, swimming laps at the pool. An advisor for the Calorie Control Council, Robyn Flipse, MS, MA, RDN is a registered dietitian and cultural anthropologist whose 30+ year career includes maintaining a busy nutrition counseling practice, teaching food and nutrition courses at the university level, and authoring 2 popular diet books and numerous articles and blogs on health and fitness. Her ability to make sense out of confusing and sometimes controversial nutrition news has made her a frequent guest on major media outlets, including CNBC, FOX News and USA Today. Her passion is communicating practical nutrition information that empowers people to make the best food decisions they can in their everyday diets. Reach her on Twitter @EverydayRD and check out her blog The Everyday RD. Those of us who live where there are four seasons throughout the year associate certain foods with certain seasons. A perfect example is eating frozen desserts, like ice cream, in the hot days of summer. But even if the temperature never gets too high where you live, frozen sweet treats are enjoyed any time of year all around the world. What Makes Frozen Desserts Taste So Good? Whether licked off a cone or spoon, the creamy consistency of frozen desserts makes them special. Their creaminess can come from dairy ingredients, like milk and cream, or from dairy substitutes, like soy, rice and coconut milks. Those without milk products may rely on bananas, fruit purees or avocado to give them a smooth texture. To prevent the formation of large ice crystals during the freezing process you may see plant-based stabilizers, such as guar gum, locust bean gum and carrageenan on the ingredient list. The endless flavor combinations of frozen desserts means there’s one to satisfy every taste preference. Vanilla holds first place as the preferred flavor in the U.S., while Whiskey Prune ice cream is popular in Australia. If you need more choices there is a shop in Venezuela that holds the Guinness Book of Records standard for the largest selection of ice cream flavors in the world, including Spaghetti and Meatballs ice cream! The one ingredient that all frozen desserts contain is some type of sweetener. Cane or beet sugar is the most common, but honey and agave syrup are also used. Many frozen treats also are made with sugar substitutes for consumers looking for a dessert with less added sugar, fewer calories, lower carbohydrate content or all three of those features. It is important to keep in mind that when you see the claims “no added sugar,” “without added sugar,” and “no sugar added’ on a frozen dessert that does not mean there is no sugar in it. It means no sugar was added as a sweetener, but other ingredients may be a source of naturally occurring sugars, such as the lactose in milk and the fructose in strawberries. Sweet frozen treats with these claims often contain aspartame, sorbitol or other sugar substitutes to provide the desired sweetness. Right next to the tubs of ice cream and sherbet in your grocer’s freezer are the frozen novelties. They are individually packaged, single serving frozen desserts, such as ice cream sandwiches, ice pops and filled cones. I still think of them as the items sold from the ice cream trucks that roamed my neighborhood on summer nights when I was a child. Just like the frozen desserts sold in family-sized containers, there are frozen novelties made with sugar substitutes. If you want to make your own sweet frozen treats you’ll be happy to know you don’t need an ice cream machine for many recipes. These Cold and Creamy Fruit Cups are filled with the fruits of summer so a perfect way to celebrate National Ice Cream Month in July. Beat cream cheese, sour cream, aspartame and lemon juice in mixing bowl on medium speed of mixer until smooth and well combined. Fold in all of the fruit using a spoon. Spoon the mixture into 12 paper-lined muffin cups. Let stand 10 to 15 minutes or until slightly softened before serving. This blog was originally written during my 2 1/2 year tenure as a blogger for Health Goes Strong. The site was deactivated in July 2013, but you can read the original post here. There has always been a link between missing teeth and poor nutrition. After all, chewing is the first step in the digestive process. It breaks down food into smaller pieces and mixes it with saliva. Our ability to chew also determines the variety of foods we eat, which is important to getting a well-balanced diet. Now there’s evidence that body weight is related to how good our chewing apparatus is. Studies from Egypt and Canada suggest poor dentition may lead to obesity. In one study researchers reported that those with only 21 out of their original 32 teeth were 3 times more likely to become overweight. They concluded that part of the weight gain can be attributed to the inability to chew whole fruits, vegetables and other fiber-rich foods that are typically lower in calories. Another way to look at it is that chewing takes time and slows down the rate at which we can consume calories. Softer foods are easy to eat and go down quickly. The good news for the baby boomer generation is that we are the first to have benefited from water fluoridation and fluoride toothpastes since childhood, according to the Centers for Disease Control. This means the majority of us can look forward to having our pearly whites for our entire lives. There really are no short cuts to the timeless advice to brush after meals and floss daily. Practicing good oral hygiene and getting regular dental exams is the best way to preserve your oral health. Dentures and replacements are not the answer. They’re expensive, have their own maintenance problems, and may never provide the same chewing ability as your own choppers. Research has also shown that use of dentures is associated with declining nutritional status, loss of taste and digestive problems. As a quick reminder of what you can do to enjoy a lifetime of healthy eating, here’s a review from the American Dental Association (ADA). Manual Toothbrush – They come in a wide range of prices and styles, but the most important feature is the ADA label of approval. Most dentists recommend a soft bristle and replacement every three months. Powered Toothbrush – This is a good option for those who have difficulty maneuvering a manual toothbrush properly. A rotary head motion that is passed over each tooth is better than cruising across the surface. Tooth paste – It’s an abrasive, so can damage soft tissues if you brush too hard. Those with added fluoride help strengthen and repair small cracks in teeth where cavities develop. Floss – It should glide easily between each tooth and not be used as a saw. Mouth Wash – Those containing antimicrobial agents and fluoride can reduce bacterial count and tooth decay. Avoid those with alcohol since it can dry the mouth making it more susceptible to bacteria. Potato chips are part of most celebrations in the U.S., but today is the day they are celebrated. Yes, March 14th is National Potato Chip Day! Since the average American consumes about 17 pounds of potato chips a year, there is no need to say anything that might encourage eating more of this fried and salted snack. Instead, I want to talk about their primary ingredient, the potato. And with St. Patrick’s Day in the same week, there is no better time to promote the nutritional and culinary benefits of potatoes. What’s So Good About Potatoes? On its own, a medium potato (5.3 ounces raw) is one of the best low calorie foods you can buy. For only 110 calories you get 45% of the daily value (DV) for vitamin C and more potassium than a banana (620 mg vs 450 mg). That same potato provides an often overlooked 3 g of protein along with 2 g of fiber, half of which is in the skin. Though colorful fruits and vegetables get more attention, the white ones, like potatoes, are also a good source of phytonutrients with antioxidant potential. The total antioxidant capacity of russet potatoes ranked fifth out of 42 vegetables tested, ahead of broccoli, cabbage and tomatoes. One of the best things about potatoes is what they don’t contain: No saturated fat, no trans fat, no fat at all. And they have no cholesterol and no sodium, either. Depending on how you prepare them, a potato can become “stuffed” with even more nutrients. I like to add salsa and cheese or leftover chili to a baked potato for a quick and satisfying lunch. Or I’ll stuff one with scrambled eggs for breakfast. Why Are Potatoes Such a Culinary Staple? One of the best ways for a food to become a staple in any cuisine is to be available, affordable and versatile. Potatoes are all three. Potatoes are consumed in some form by people on every continent. In the U.S., frozen is the most popular form, followed by fresh, chips, dehydrated and canned. They can be cooked by baking, boiling, deep frying, grilled, microwaving, pan frying, roasting, and steaming, plus in casseroles and slow cookers. Every cook appreciates that kind of versatility when faced with limited fuel or cooking facilities. The most common varieties are categorized as russets, reds, whites, yellows (or Yukon’s) and purples. The shapes and sizes cover everything from the finger-shaped fingerlings, to round ones ranging in size from golf-balls to baseballs, to the classic oblong russet. That’s enough variety to serve them every day and never see the same ones twice in a month! To tell the truth, the only potato I can’t recommend is the couch potato! Go to PotatoGoodness.com for recipes and videos.